The month of April is rich with random, made-up holidays: April Fool’s Day, Take-Your-Daughter-to-Work Day, National Juggler’s Day, Hair Appreciation Day, Pigs in a Blanket Day (no joke) and now, drumroll please…… National Siblings Day. Few flowers make a finer choice than the sensationally colorful snapdragon for celebrating this somewhat dubious day set aside to honor the folks who share about 75% of your DNA and a whole lot of inside jokes. The colorful petals of these crazy-shaped blooms will brighten the day of your brother or sister and remind them how lucky they are to have you in the family. According to the language of flowers, snapdragons are symbolic of graciousness and strength, two characteristics that we possess thanks to the often trying relationship with our siblings. Why not thank them on this questionable holiday for their help in making you who you are today with the gift of flowers. 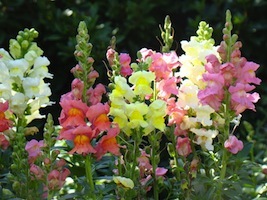 Snapdragons are a tall, upright annual with stems reaching between 1-2 feet in height. They are straight with a slight curl at the tip and have blooms that open from the bottom upwards, similar to gladiolus, but more delicate. Native to parts of Europe and North America, these lovely flowers are popular as bedding plants as well as cut flowers. They are prized by florist for their straight form and ability to stay fresh as cut flowers for a week or more. Their brightly colored blooms come in solid yellow, orange, pink, white and red, with many cultivars having several shades on each flower. 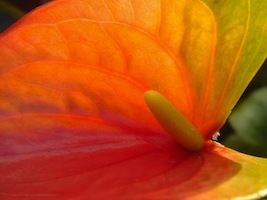 Typically, the lower part of the flower is a darker shade with the color lightening towards the center throat of the flower. The name snapdragon comes from the resemblance of the flower petals to the shape of a dragon’s head which, when pinched between the fingers, snaps open its “mouth.” Playful and sturdy, these flowers can handle a bit of roughhousing and still look dainty in a tall, fluted vase. Snapdragons look great on their own or mixed with other flowers in a bouquet or arrangement. Lovely with lilies or dazzling next to dahlias, the tall stems of snapdragons are sure to get noticed. With a very faint scent, consider pairing them with roses or flowering stock for a bit more fragrance. 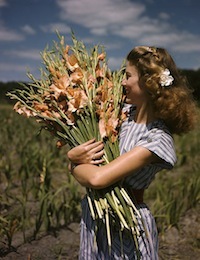 Snapdragons are available year-round and are reasonably priced at around $2 per stem at your local florist. Send some to a sibling today who will be shocked and somewhat puzzled that you remembered it was National Siblings Day.